In low or raveled areas, it may be possible to perform a surface repair commonly known as “skin patching.” This should only be done after making sure that the new patch will not interfere with any drainage. The area to be patched is take with a coating of SS1H emulsion over the damaged area. Then, hot mix asphalt is placed over the tacked surface and compacted. Areas that are deteriorated may require complete removal and replacement. In this type of repair, the distressed area is saw cut approximately one foot around the perimeter into undamaged, solid pavement. The, the asphalt is removed and the base is graded and compacted. Hot mix asphalt is placed into the hole, raked or installed through a paver and compacted flush to the surrounding surface. 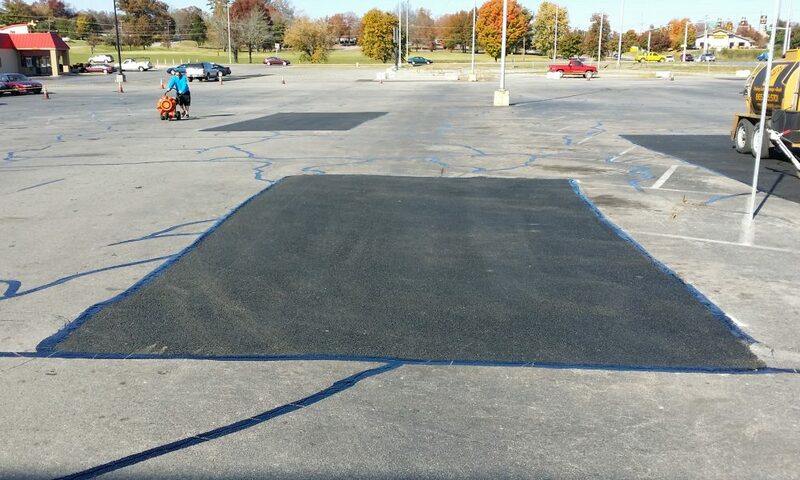 An asphalt overlay is the process of installing a new layer of hot mix asphalt directly over existing asphalt. In order to be a candidate for overlay, pavement should be relatively sound without large areas of base failure. Prior to overlay, pavement repairs and transitions must be made. Cracks should be filled with rubberized crack sealer, and tack coat applied over the entire surface. As a final step, a new layer of asphalt is then placed. As asphalt overlay is the least costly of the reconstruction techniques, but also has the most drawbacks. These drawbacks include elevation considerations, inability to make drainage corrections, a limited service life and a tendency to show reflective cracking in a relatively short period of time.